I recently watched the movie Inside Out and was fascinated by its creativity and elegance to describe the intricacies of the emotional brain. 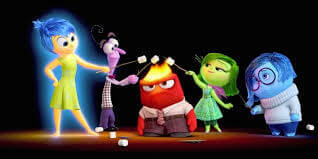 The well-made animated movie, produced by Pixar explores the nature of emotions and the self and describes how emotions are valuable components to our mental health and well-being. The consultants for the movie were two world leading expert on emotions. The first consultant is Paul Ekman, who wrote many books on emotions, including Emotional Awareness who was written together with the Dalai Lama. The second consultant is Dacher Keltner who is one of the founder of the Greater Good Science Center. Their knowledge, expertise and insight was instrumental in creating the movie and explaining the complexity in which emotions play in our psychology. Riley (Kaitlyn Dias), happy 11 years old girl is uprooted from her comfortable Midwest life when her father got a new job in San Francisco. The transition to the stressful city is not easy and bring about new challenges that Riley must face. If Riley the happy kid experiences mostly joy (Amy Poehler) in the Midwest, now she starts experiencing other uncomfortable emotions such Sadness (Phyllis Smith), Anger (Lewis Black), Fear (Bill Hader) and Disgust (Mindy Kaling). Like all human, Riley is guided and directed by her emotions. They drive Riley behavior and makes her react to what takes place in the word around her and adjust to them. Riley’s natural disposition is happy and joyful. She tries to keep things pleasant and positive. Yet, when Joy is replaced by Sadness and afterward has changed to the feelings of Anger, Fear and Disgust, Riley need to deal with unfamiliar territory. Understanding the value of difficult emotions like fear, anger, sadness and discussed is paramount to happy life. For example, sadness acts as vehicle to morn our lose and move toward acceptance and maturity. Disgust helps avoid toxic situation. Fear help us see danger and prevent harm. Anger serves as energetic force against injustice and when felt attacked. Emotional intelligence and emotional maturity s can help us in many ways. I encourage anyone to watch this movie and if you are a parent to watch it with them. It is not only a delightful movie, but also a powerful movie that explain about life, moral and emotions. Go and see it. Enjoy.